It frequently happens that a term gets applied to a particular team and it sticks, even 40 years later it’s repeated every time they step on the field. Total Football was invented by Netherlands and Ajax coach Rinus Michels to describe the theory that any player can take over the role of any other in a team. Any player who moves out of position is replaced by another from his team, thus retaining the team’s intended organisational structure. Total Football’s tactical success depends on the adaptability of each footballer within the team and it places high technical and physical demands on them but it would also require the ability to think for themselves so it would work well with the Dutch but be next to useless in England. What would be the astrological significator of Total Football. It has to include Mars obviously but for the capacity to play anywhere across the field, travelling long distances from your original position would require a strong Jupiter. This kind of multi tasking would need an opposition aspect rather than a conjunction and the physical demands would need strong signs with the ability to dig deep. How about Mars in Scorpio opposition Jupiter in Taurus ? Of course to be able to integrate this demanding concept and make it a fundamental feature of a team’s identity, this aspect would have to be related to the Sun as well. 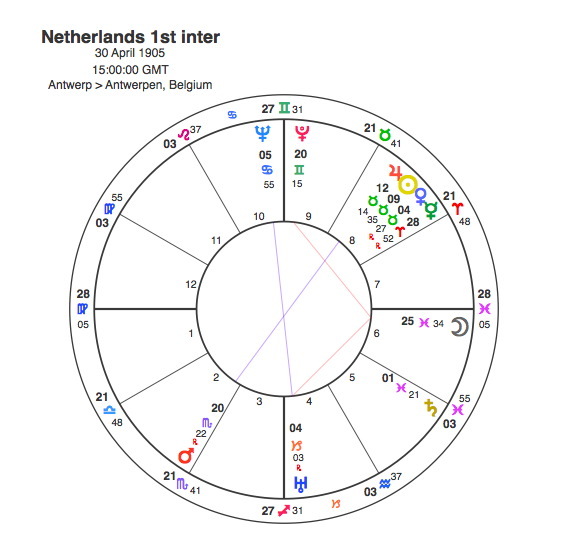 The chart for the Netherlands contains the Sun conjunct Jupiter in Taurus opposite Mars in Scorpio. But it also has the Moon in Pisces which adds to the fluidity of movement required to carry out this approach to the game. To those of us watching, the great Dutch side of 1974 which should really have won the World Cup but were beaten in the final by the hosts, West Germany, personified this notion of Total Football. And none more so than Johann Cruijff who seemed to have mastered the art of being in two places at once. 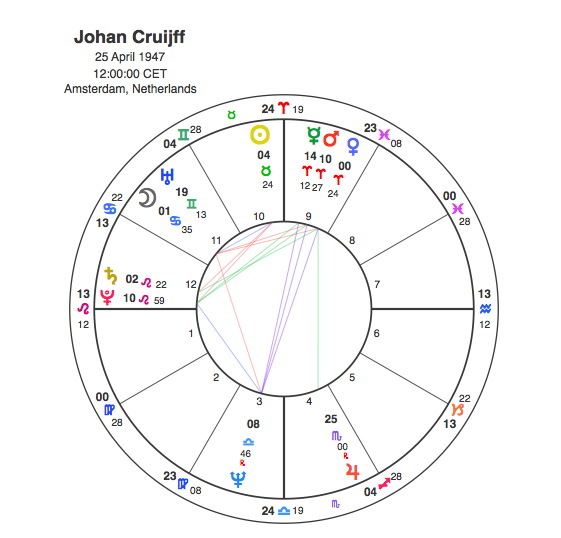 Cruijff’ was also a Taurus and his Sun was exactly ( to within 3 minutes ) conjunct the Netherlands Venus. There was one particular trick that has always been associated with him, the famous Cruijff turn. This is clearly shown in his chart by his T Square as it happens elegantly at high speed ( Venus conjunct Mars in Aries ) which leaves opposing defenders ( opposite to ) confused and turned inside out by a piece of magic ( Neptune ). The net effect is that Cruijff emerges appearing to defy the laws of physics by running sideways ( T square apex Moon in Cancer, ruled by the Crab ). That 1974 would be his peak was shown clearly by the fact that Pluto was transiting the T square conjunct Neptune, opposite Mars and square the Moon. For the Dutch team in 1974, Jupiter was in Pisces sextile the Sun / Jupiter conjunction. In 1978 the Netherlands had exactly the same result in that they lost in the World Cup Final to the hosts Argentina. Staggeringly, Jupiter was in Cancer, sextiling the Sun / Jupiter conjunction from the other side. After this they didn’t reach a World Cup Final again until 2010 when Jupiter was back in Pisces although this time it was slightly past the Sun / Jupiter sextile and conjunct the Moon. And in another extraordinary mirror image arrangement, they missed the final of 2014 only on penalties as Jupiter was in Cancer trine to the Dutch Moon. Having never won the World Cup, its easy to get the impression that the Dutch would always impress but fail at the final hurdle, but their crowning glory was the European Championships of 1988. That this moment was the destiny of the national team was announced by the fact that Pluto was opposite the Sun / Jupiter at the time. It was confirmed by Neptune’s trine to the Sun / Jupiter. The ultimate astrological tribute to the total football of the Netherlands was the fact that the transiting Jupiter had returned to Taurus and was opposite Mars during that summer of 1998. Pluto was the power that brought the Championship to the Dutch and Ruud Gullit was its emissary. 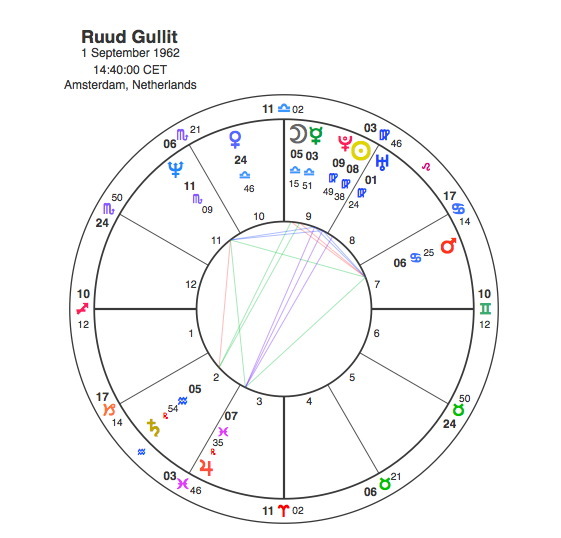 This is clear from the fact that Gullit had an exact Sun / Pluto conjunction in Virgo. Not only that, this conjunction was the Kite to a formidable Grand Trine in Water signs involving Mars in Cancer, Jupiter in Pisces and Neptune in Scorpio. All these 5 planets made aspects to the Netherlands Sun, but especially Gullits own Sun which was in exact trine aspect. That he was also a devotee of total football was confirmed by his Mars / Jupiter trine. 1988 saw Pluto, Neptune and Jupiter all transiting Gullit’s Kite formation an incredible combination and clearly the astrological peak of his life. They also had a massive effect on one other player. 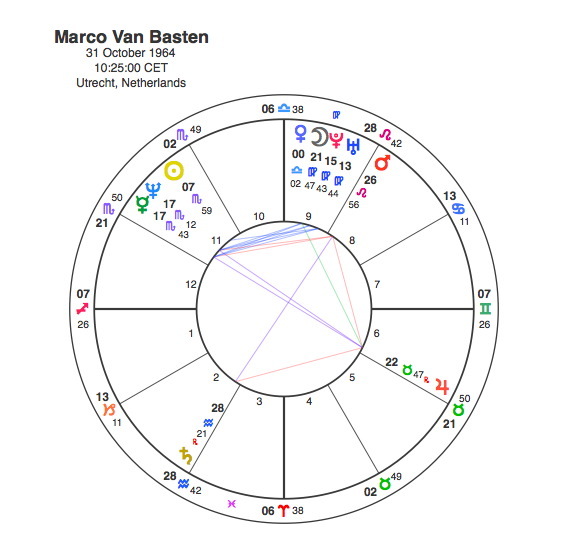 Marco Van Basten was a Plutonian like Gullit as he had the planet conjunct his Moon in Virgo. He was also a follower of total football through his Mars / Jupiter square. Van Basten’s Sun was exactly opposite the Netherlands Sun so Pluto was conjunct his Sun in 1988 when he scored possibly the most memorable goal of any European Championship. So is there another major trophy on the cards in the future ? The Euros in 2028 have Pluto at 8 Aquarius, square to the Dutch Sun but Saturn is conjunct the Sun at the same time so its unlikely to happen. Perhaps 2022 with Neptune on the Moon and Uranus opposite Mars. They might not win anything but no doubt it would be fun to watch.